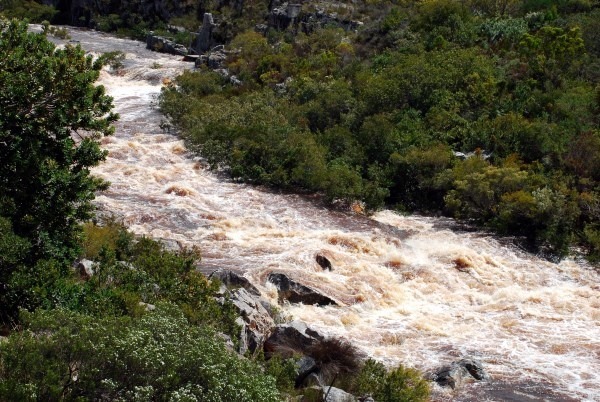 The Palmiet River starts its life high up in the hills just south of Franschhoek. 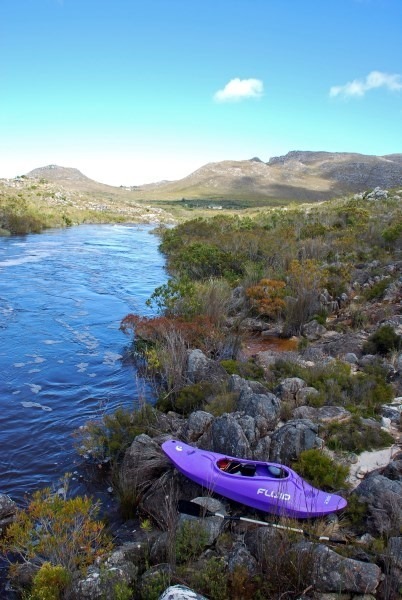 From here it begins its journey down south where it spills into the Atlantic Ocean only a stone’s throw west of Kleinmond – a distance of about 73km from source to sea. We are only interested in the last few kilometres. Length: 21 from top, 3.5km for short section. Gradient: 5.3m/km from top, 9.4m/km for short section. 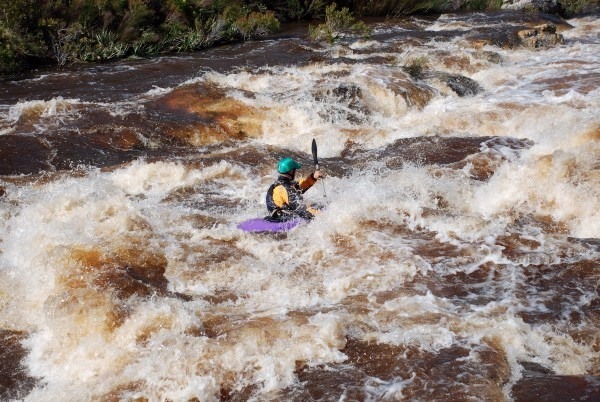 Character: Pool drop, rapids mostly quite open, certain sections channelled. Level: 1 – 50+ cumecs. Gauge: DWAF gauge G4H030 - Palmiet at Kampanulla. Or weir above final rapid, anything above 0.4m is good enough. Duration: ¾ day for full section, ¼ day for short section. Dams: Arieskraal and Kogelberg Dam. Take out: R44 bridge near river mouth. [GPS 34°19'51"S 18°59'28"E] Out: 1m. Warnings: V+ waterfall on full section., run once thus far by Andrew Kellett. Portaging the waterall on the full section. 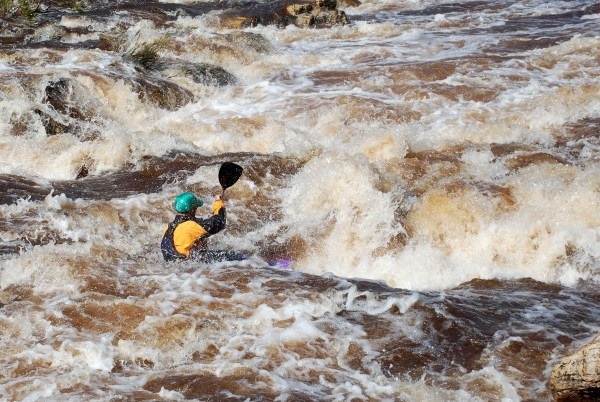 Abrie Swanepoel on the rapid just above the put in for the short section. If you are keen to walk further you can reach this one. The map I drew on AutoCAD. Entirely to scale. Bubble and Squeak. Phil Swart in the centre. Myself at Bubble and Squeak. I think Rowan Walpole took this pic. 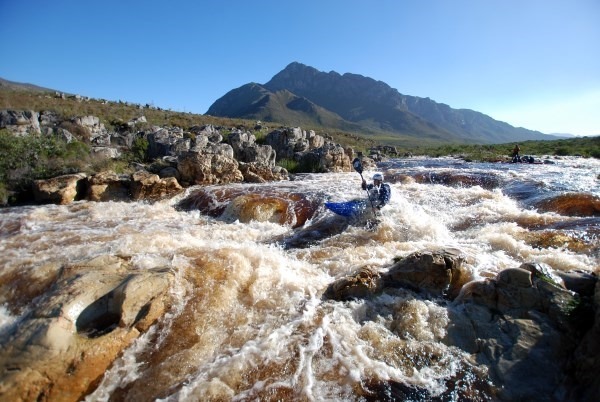 The full section consists of a fair amount of flat water and a few fun rapids. The put in requires a long drive around and also permission from the land owners to get on their property. It’s a huge commercial farm and there are gates (with a guard) that control it so don’t think you can just head up and hook it. 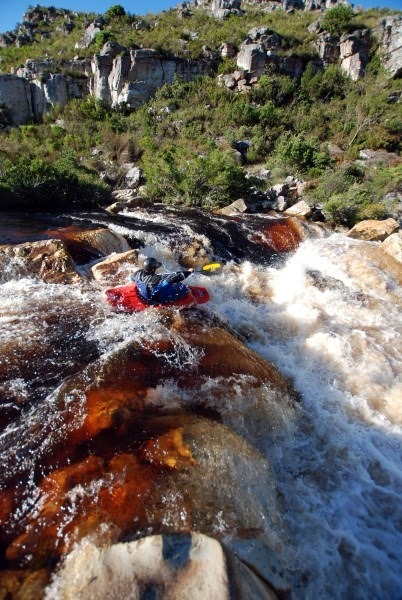 The river starts off with some pretty extreme tree/bush channels – be careful. 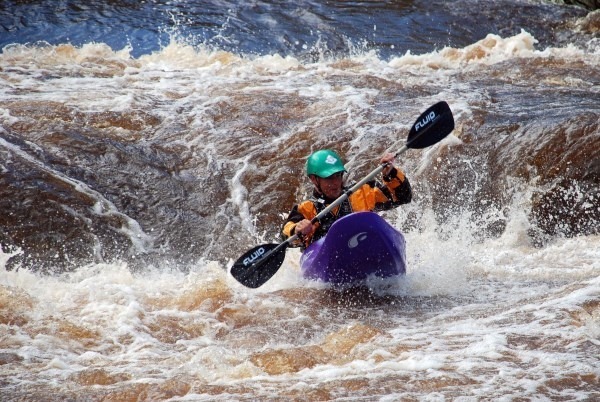 3km from the start is a weir, portage on river right or run it, but be sure as it is retentive. This is the gauging weir that DWAF show on the internet. Put in at this weir. Don’t bother using the “normal” put in if doing the full section. 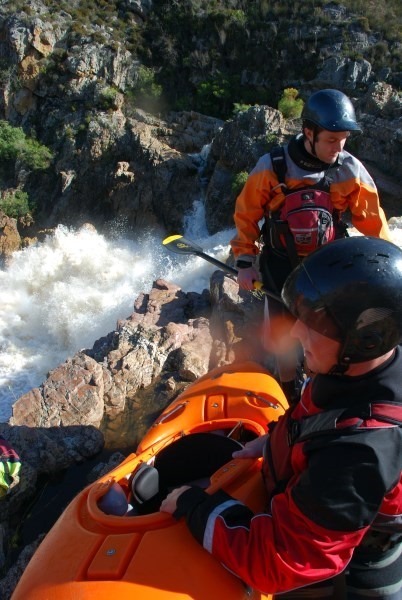 4km from the weir is the waterfall, portage on river left, ropes may be required to assist in the 3 or 4m climb down. It has been run once before by Andrew Kellett, but is only for the very brave. The right is heinous. Shortly after the waterfall are some more rapids which may take you by surprise and then a few more rapids, not many I might add, with some longer flat sections. 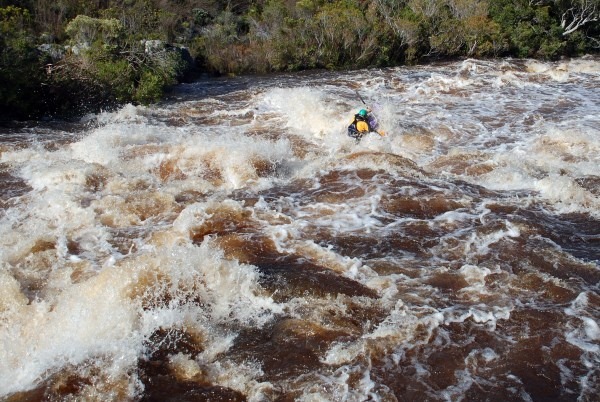 There is a fun rapid just above the put in for the short section. 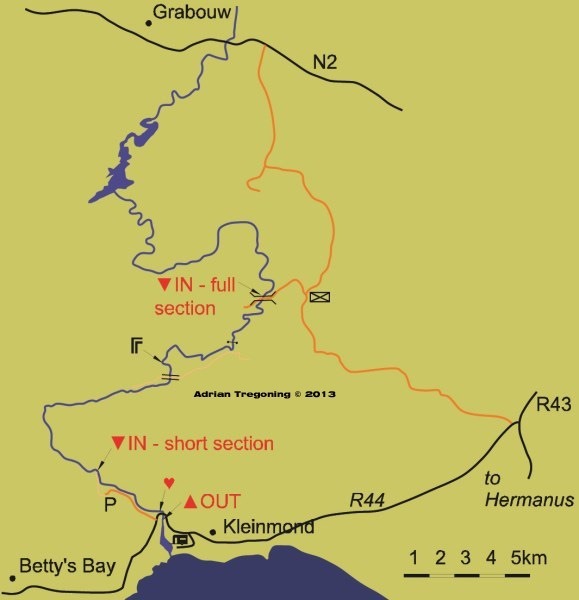 To get to the put in for the short section - from the R44 heading from Bettys Bay to Kleinmond, turn left at the sign saying Kogelberg Nature Reserve. Gate is open from 07:30 to 19:00. Drive up the road and pay at the boom gate. From there, drive another 150m and leave your cars there. Walk out for 1.3km on the single track path to get to the river. Do not walk through the bush as fynbos is very susceptible to trampling – stick on the paths. This section has a variety of different rapids all of the pool drop nature. 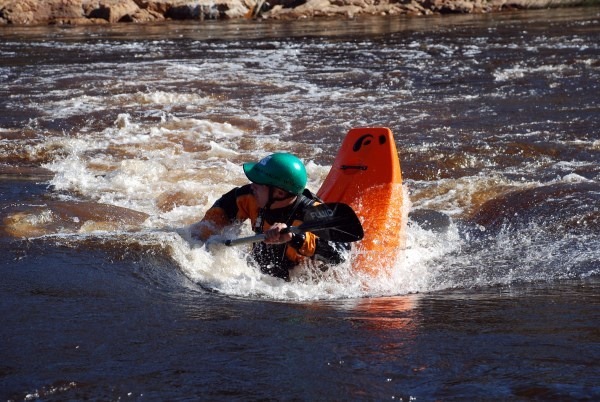 The water moves fairly swiftly between rapids and the 3.5km section can be run in under 25 minutes if you push it. The first rapid below the put in is called Hand Stands Up. It is a ledge drop about two feet high and usually has a hole about three metres upstream of the ledge. This hole is excellent for playing in but you best have a very fast roll to avoid some pain and discomfort. Run mostly on the far right, or else boof somewhere in the centre. 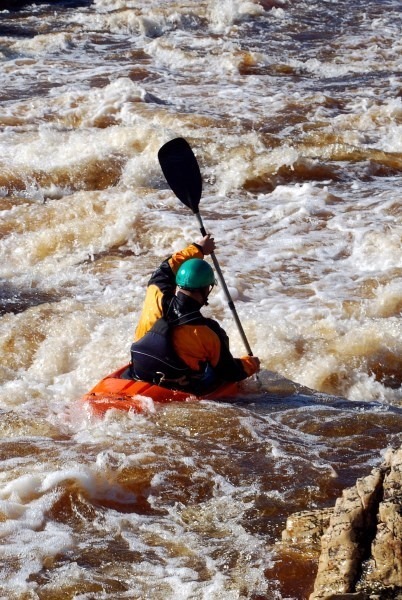 At high levels this is the most dangerous rapid, although it doesn’t look it. The hole is deep and recycling so be very careful. The next big rapid is Bubble and Squeak. 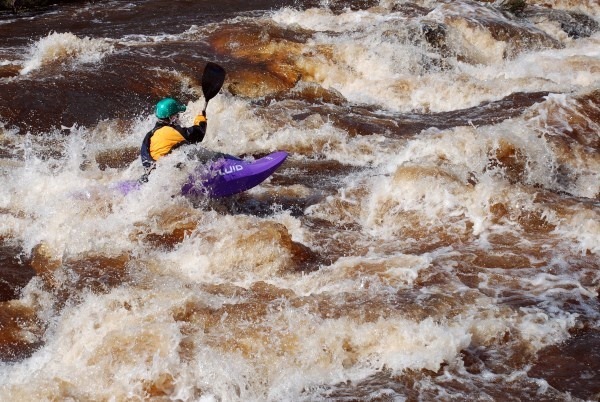 One usually runs left at the top and at most levels it is possible to eddy out on the right before the steepest part of the rapid. There are a variety of lines to choose from and these also depend on water level and mood. Watch for the rock on the left near the end, it often gets beginners. Just downstream there are a few twisty channels to negotiate and at low levels things can get interesting if you choose the wrong one. Watch out for getting strained. There are a few areas like this elsewhere on the river so keep a sharp eye on beginners. Myself centre line of Hand Stands Up. 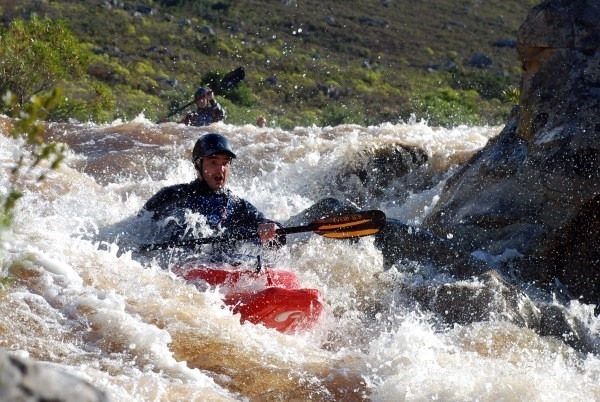 Myself running Bubble and Squeak at flood level. Abrie Swanepoel running the right pourover line of Waterfall. Judgement Day, the “gates” being at the bottom, right of centre. At high way one can paddle straight over the Gates. Judgement Day at flood. Photo by Braam Rademeyer. Myself playing at “90’s Hole”. Pic by Braam Rademeyer. Below the waterfall are some small rapids and then a pool ending in a weir. 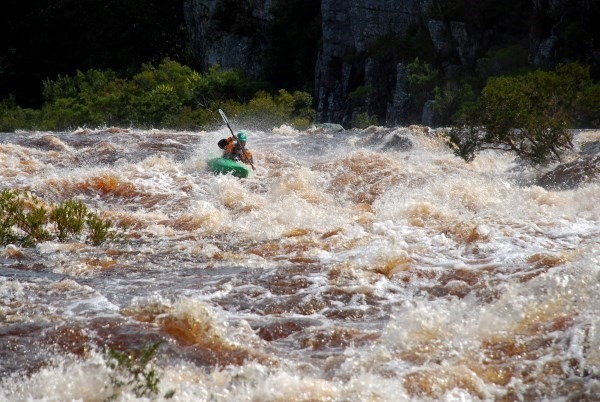 This is the top part of the final rapid, Judgement Day. Run the weir second from the right at most levels, far right if the river is high (but be very careful as this side is highly retentive) or portage totally if in doubt, but check first. Left also has options at flood. Immediately below this is a rocky little rapid, a right bend and then another narrower weir which forms an excellent play hole at certain levels. It is deep enough to loop and cartwheel in and has eddy service at certain levels. Just make sure you have a fast roll. 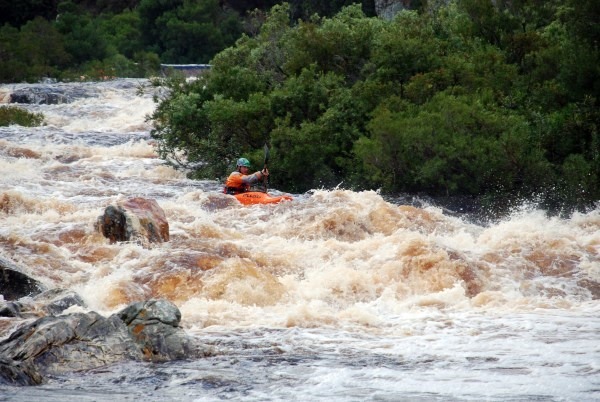 A few metres downstream is the main part of Judgement Day rapid. When the water is medium to low the top part is a gentle slide, ending in a narrow hole and this too is ok for playing in. The water swiftly moves a little right and down towards the final section known as The Gates. There is a large rock in the main flow with a hole directly upstream of it. This causes a lot of carnage and is always a good spot to get photos, especially if you like carnage. Hug the rock to the left or run far left if you’re particularly skittish on the day. At high levels, go right over the big rock. Hike up on river left below the bridge. There is another rapid directly after the bridge with a hole that works according the river level and the tides – we call it 90’s Hole because of the sharp 90 degree bend the river makes. The ocean is only a couple hundred metres away and this hole is influenced by the tides unfortunately. It is not bad for playing although angled so not suited to inexperienced play boaters and mostly it flushes very quickly. It is often deep enough to cartwheel in. Do not jump from the bridge into the water, ever. Several people have been hurt here. All words, photos (U.O.N.) and the map courtesy Adrian Tregoning.